Home » All Forums » [Miscellaneous Forums] » Miscellaneous - Off Topic & "Lighter Fare" » BASEBALL 2018 - The Official Thread! Helpful ReplyHot!BASEBALL 2018 - The Official Thread! BASEBALL 2018 - The Official Thread! With the Angels winning he Ohtani sweepstakes, the Giants (or some other desperate team) about to take a huge risk on the new, non-steroidal HR King, and the Winter Meetings about to commence -- now is the perfect time to start the annual thread about the once and now again True National Pastime of the United States of America. The Hot Stove is officially LIT !!! Right off the bat (so to speak) Giancarlo Stanton has vetoed trades to the foolishly willing Giants and Cardinals. Evidently, he wants to be a Dodger. Trouble is that the Dodgers are already paying the largest 'luxury tax' in MLB, though it would give them a chance to dump the mercurial Puig. I'm sure that Mattingly is already having flashbacks and night terrors! But the Marlins must unload the fragile Stanton who, including last season, has only played as many as 150 games twice. His value is presently at its max; injury prone, every game he plays for Miami presents daunting financial risk for a franchise that again finished dead last in attendance - even with their shiny ballpark, potent lineup, second place finish, and 59 dingers from the 'Big Guy'. What was Jeter's group thinking? That franchise perished along with Jose Fernandez. Loria knew that and is now at the bank, laughing at his luck in finding those suckers! EDIT: As he was nearing retirement and was immediately inducted into Cooperstown, I'll leave The Great One aside in asserting that the tragic death of Jose Fernandez represented the greatest loss to 'baseball history' ever from death or disability. Yes, consideration must be given to Pete Reiser, Herb Score, and Tony Conigliaro; Ken Hubbs, Thurman Munson, and Lyman Bostock must be mentioned - but Fernandez was a generational talent. He was truly awesome, the foundation of that franchise. With him, the Marlins would have been in a dog fight with the Nats. Without him, the Marlins are forced into a fire sale tear-down when their re-build was on the verge of sweet success. How many fire sales can baseball fans in one city bear? Whatever the single-season record for team strikeouts is, if the deal goes through I think the Yankees are now primed to threaten it. ...along with 100 home runs just from those two.....we'll gladly take it!!! It's all over the internet so it must be true. Aside from the fact that the Yankees' acquisition of Stanton makes no financial or "baseball" sense, it will be more entertaining than "The Greatest Show on Earth"! But why stop with Stanton? They should get Joey Gallo from the Rangers and corner the market on exit velocity! Then the Yankees could charge a $50. separate admission to watch batting practice! Hell, I'd pay it! This virtually guarantees that J. D. Martinez will be signed by the BoSox. And, with J.D. I believe that Boston would score as many - or more - runs as the Yanks and, of course, pitch and defend better. In any case, it's a bad day to be an Oriole, Blue Jay, or Ray fan. EDIT: Anyone wanting to say I started this thread too soon? Watching the goings-on at the Winter Meetings leaves me, a life-long Pirate fan, feeling like a Dickens character - out in the cold watching through a frosted window as the wealthy feast and make merry. And, as such, I feel for my brethren in Tampa, Miami, Kansas City, Oakland, Milwaukee, Baltimore, Cleveland, and Minnesota. Yes, some are presently riding high and brimming with optimism, but all must know that heartbreak is inevitable, that "dynasties" will forever be denied them. As an industry the one thing the NFL does far better than MLB is to maintain competitive balance. If it is to sustain itself as a truly national sport with 30 teams, MLB must find a way to improve in this crucial regard. Well, nothing much is happening in MLB, but I saw a story this morning about Arizona's 1st. round draft pick paying off his parents' mortgage. Turns out that he played for my alma mater, The University of Virginia. For some reason, Mr. Jefferson's University instills grace, gratitude, and generosity in those privileged to attend. A notable example of this was the Barber twins, Tiki & Ronde, donating $1 MM as a 'thank you' for their education. As BLACK & GOLD NATION was already numb from the Steelers' failure to hold the Jag-Offs to fewer than 42 points, the Penurious Pirates picked an excellent time to shed Cutch and the Cole Train from the payroll. Congratulations to the Giants and Astros. Finally, MLB is coming to its senses and not giving out franchise-crippling long-term contracts like Cabrera's, Pujols', Greinke's, Stanton's, and Votto's. Even the NYY seem to be coming to their senses. Soon, there will be a free-agent fire sale; I hope my BOTTOM-FEEDING BUCS will be there to pick up some bargains! For two years @$8MM per The Todd-Father would look good in a Pirate uniform. The Todd-father prefers to stay in New York. He lives down the road from me in Toms River, and drives home every night from a home game. Finally, MLB is coming to its senses and not giving out franchise-crippling long-term contracts like Cabrera's, Pujols', Greinke's, Stanton's, and Votto's. I have to admit to being somewhat puzzled by the Brewers' willingness to give 31-year-old Lorenzo Cain $80mil for the next 5 years, especially after acquiring Christian Yelich, but I guess it's part of the plan. Anybody need an outfielder? That signing had me scratching my head, too. I thought for sure that the Giants were going to grab him to patrol that huge CF of theirs. And, that $80 MM would have gotten them Cobb or would have been a big down payment on either Darvish or Arrieta. In any case, Brewers fans are lucky to have Attanasio as the owner instead of Nutting . Or, maybe there is something to this SABREmetric "WAR" stat - last year he was a 5 and two years ago, a 7. At $8MM/WAR he could be a bargain, but a 31 year old who is basically a 'legs' player is high risk for a 5 year deal. 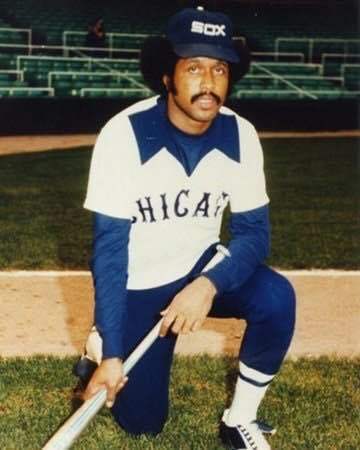 Oscar Gamble, one of my all-time favorite players and a crucial member of the 1977 South Side Hit Men, passed away yesterday. His 'fro (especially from his Cleveland days) belongs in the Hall of Fame. Nutting opened his wallet and allowed Huntington to sign Daniel Nava! That means that Huntington will be able to trade Josh Harrison to the Mets for an assistant scoreboard operator and a beer vendor. Edit: And it is especially galling to see the Metsies snag two prime years of the Toddfather for only $8.5MM/per. I guess Nutting is waiting patiently for Kang to sober up, stop beating women, and qualify for a work visa! Or, maybe he hopes Colin Moran, one of the crumbs the Astros gave for Cole, will fill the bill for the MLB minimum $$$. So the Cubs decided Yu Darvish is worth $21,000,000/year for 6 years. I'll bet they just edged out the Pirates with that offer. He played for the Phils in the early 70s and is one of the first players I can remember being a fan of (I would have been just old enough to start recognizing players at that point). I think his hair stuck out to me. Nava is coming off an outstanding 2017 as a pinch hitter and spot starter for the Phillies. He seemed to be hot with the bat almost the entire season. They had to conserve their funds to afford BoSox cast-off Bryce Brentz. If he can produce in Pittsburgh what he did for Pawtucket we'll never miss Cutch. Only if you take Josh Harrison and his contract, too. Be still my heart ... "my" PITTSBURGH PIRATES have signed Michael Saunders, a Philly cast-off. I'm sure he'll come in handy as "we" battle it out with the Cincy Red Legs for the NL Central Cellar and a higher pick in the 2019 MLB Draft. I saw that yesterday and thought about posting it here, but didn't want to spoil the surprise for you. At least they haven't exhumed Kiner and Stargell in order to fill roster spots. 1) Cutch. I understand. He had to go. And they literally gave him away; the Bucs got a second round outfielder with a less than mediocre record in A ball, a sad sack marginal reliever, and "international bonus money". But why didn't they do it last year when the Nats were hot after him? The Nationals "settled" for Adam Eaton and paid a King's ransom in prospects for him. 2) The Cole Train. The Yanks and the Cubs were both lusting after him. Surely, the cubbies would have given up Pittsburgh native Ian Happ for him; that would have made the fans Happy! And the Yanks would surely have parted with a top prospect or two, perhaps Frazier and Andujar. But no, the Astros got him for a hope and three jokes. I know it's only spring training, but the Yankees beat the Red Sox today, and that's always good...so all is right in the baseball universe! It must be nice to root for a team in "The Premier League". K.C., Oakland, Miami, Milwaukee, Pittsburgh, Cincinnati, Tampa, Minneapolis, Cleveland, and the Mike Illich-less Detroit should form a "Have Not League" of their own with their champ playing the Premier League champ in the World Series. And the Premier League would not always win as one or several of the Have Not's would field a great 'home grown' group such as what Cleveland presently has and K.C. had recently and Milwaukee and Minnesota will soon will have. Over time, every dog will have their day; there just won't be any "dynasties". True...but when you root for the Yankees(arguably the greatest sports franchise), you also get 100 years of baseball history and legends. You also get the possibility of playoff games every season(27 world series victories) so almost every year ,you are in the thick of things, and every game matters. You see great talent and therefore great games. It's always about adding one more chapter to the legend....and IT'S FUN. The Yankees never rest on their laurels.We embrace our glorious past. work hard as a team today, so we continue to enjoy great baseball. Ever wonder why Yankee baseball is loved around the world, not just in New York. Yes, I enjoy going to the A ball Phillies franchise locally here, where even a fly ball can be an adventure. It's fun baseball...and a good price day at the park,but the Yankees represent a baseball team almost always, state of the art...and that's fun too.I love baseball in general, but it's also fun being engrossed in a legend. Just as I I NYC as a place to visit I respect the Yankees franchise and consider their dominance over the past nearly 100 years to have been good for MLB. You'll get no argument from me that they are the greatest franchise in all of sport. Even though I never root for them, they sure have been fun to watch over the years. (Nobody would remember the 1960 Series had the Pirates beaten the Indians or the White Sox). And with Judge, Stanton, Sanchez, Torres, and Andujar that "fun" will definitely be continuing.